Acquario Villa is a small and cozy guesthouse placed in a comfortable environment with fresh air and peaceful sound of nature. Surrounded by a tropical garden the villa provides a private and tranquil stay for their guests. 2 Superior apartments tastefully decorated in a Creole manner with all the latest comforts. The apartaments have air-conditioning, open air verandas and a fully equipped Kitchen. The bedroom has plenty of wardrobe space and a king size bed. 4 standard apartments are 2 bedrooms family apartments also decorated to the acquario villa standards. However, If you only book one room in the standard apartment then you have to share the kitchen, living room and veranda are with guest from the other room (if occupied). The rooms in the standard apartments are big, with private ensuite bathroom and air-conditioning. 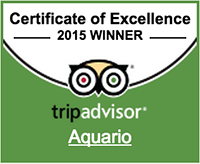 Although designed for self-catering, Acquario Villa can provide dinner for guests on request. © 2017 Acquario Villa. All rights reserved.